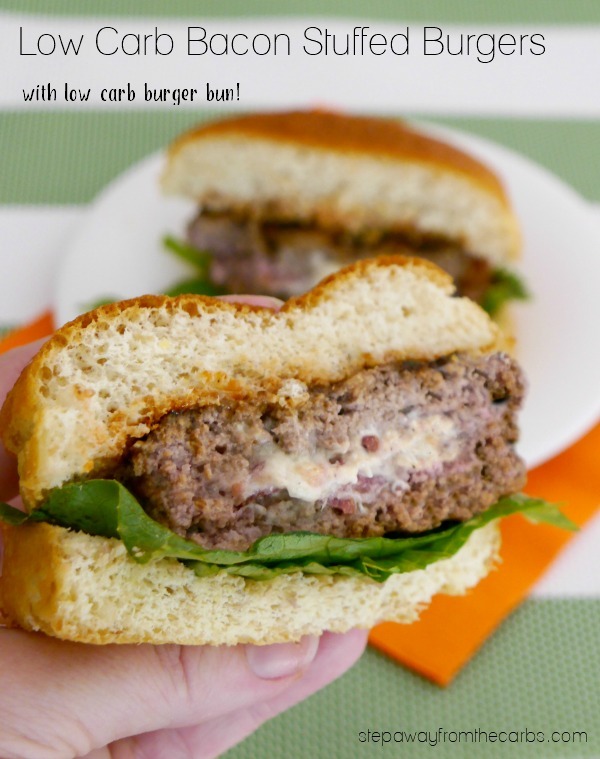 These bacon stuffed burgers are super tasty and are served with low carb burger buns and ketchup! I don’t know about you but I’m spending pretty much every evening outside at the moment – and that means that I want to grill my dinner as often as I can! 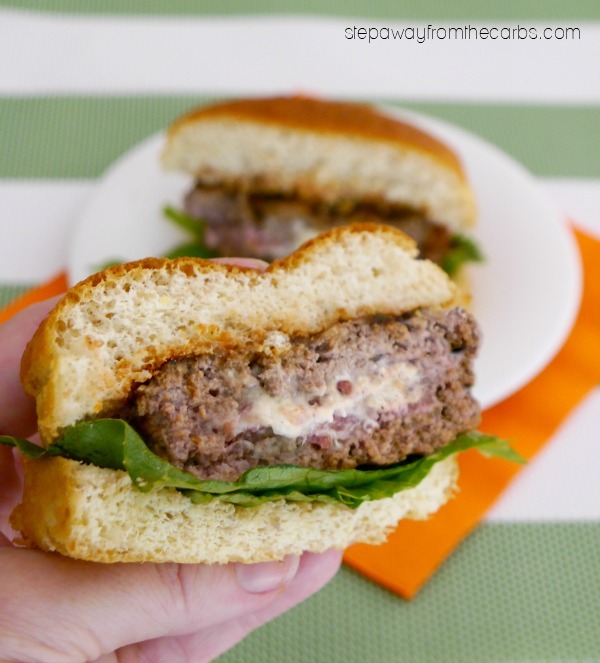 I prepare these super tasty bacon stuffed burgers during the day, so they’re ready to go later. They’re a real crowd-pleaser – even my picky six-year-old will eat them – and it’s not often that I say that! 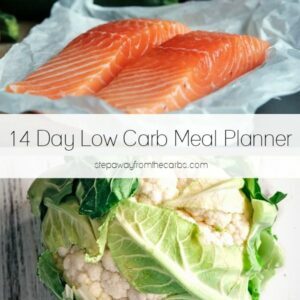 I’m also currently trying out these SmartBuns – and I’m really impressed! They come in packs of four, individually wrapped. 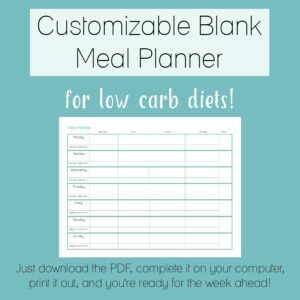 Put them in the freezer when you get them – super convenient to defrost them as you need. 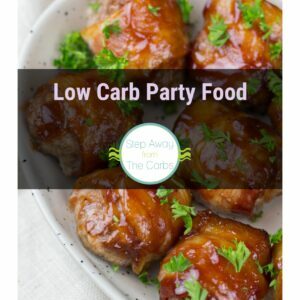 They’re available in plain or sesame versions, and the carb count is 4g net carbs per bun (unless you also exclude sugar alcohols – when the carb count drops to zero!!!). They don’t even have a scary ingredient list; here are the top components: Purified water, proprietary fiber blend (oat fiber, rice fiber, corn fiber, flax meal), eggs, erythritol, whey protein isolate. And they’re SO tasty – I’d really recommend trying them! 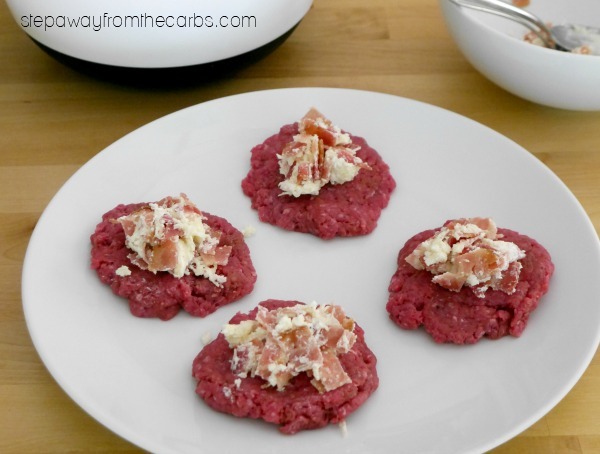 To make the filling, mix together chopped cooked bacon, cream cheese, and shredded cheese – I use an Italian blend. Set aside. Combine ground beef with Worcestershire sauce, salt and pepper. Divide the mixture into eight, then make four thin patties and place them on a plate. Divide the bacon mixture between the four patties. Form four more patties from the remaining beef mixture, then place each one on top of the first patties. Seal the edges and flatten them as much possible. Grill the burgers over a medium-high heat until desired doneness is reached, flipping over half way through cooking time. Serve the cooked burgers on toasted SmartBuns, with lettuce and low carb tomato sauce – I’m loving the new G Hughes ketchup available from Netrition. It’s sugar free, has great flavor, and only 1g net carb per tablespoon. It’s also deliciously thick with just the right amount of a sweetness. I’m a huge fan! I served these burgers with my Horseradish Coleslaw which is the perfect accompaniment. 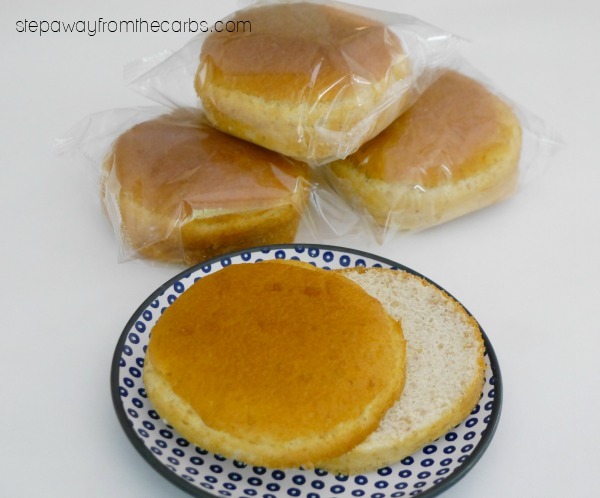 Update – you can also buy these buns (plain or sesame) direct from Smart Baking Company , and there’s 10% off when you use coupon code “StepAwayFromTheCarbs”. Order some today! To make the filling, mix together chopped cooked bacon, cream cheese, and shredded cheese and set aside. 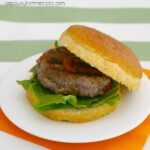 Serve the cooked burgers on toasted SmartBuns, with lettuce and low carb tomato sauce. 1g net carbs per stuffed patty. SmartBun extra 4g net carbs per serving, G Hughes Ketchup 1g net carb per serving. Total: 6g net carb per complete burger. 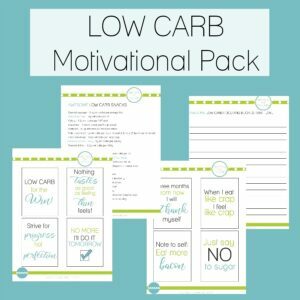 Don’t forget to check out these low carb products and LOTS more at Netrition.com!